NPS – Homeless and Loving It! During our stay in Hot Springs, Arkansas we needed service work done on the RV several times. This meant leaving the trailer at the repair shop. Since we had to find temporary housing it was a great opportunity for some short “vacations”. Our first trip was to Fort Smith, AR on the Arkansas/Oklahoma border. We visited the Fort Smith National Historic site. Originally built as an Army fort on the far western frontier to protect settlers from Indian attacks and outlaws in 1817, it later became a federal courthouse and prison until it closed in 1896. There are exhibits on the U.S. Marshals, outlaws, Judge Parker and the Trail of Tears. We’d hoped to return to participate in one of the trial re-enactments they hold there but didn’t make it. 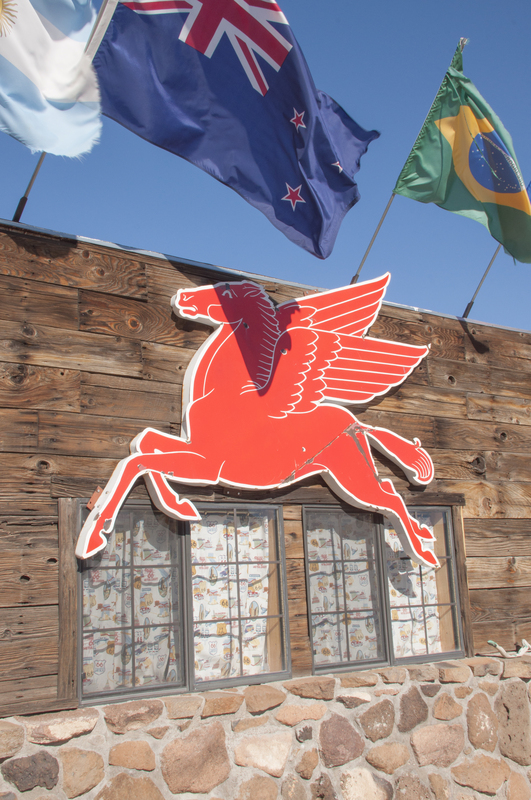 Fort Smith has one of the most unique Visitor Centers we’ve seen. It is in a former brothel. We thought we’d just stop in for a moment and look around. This is a slow time of year and the docent asked if we’d like a tour. So for the next 45 minutes we were entertained by the story of “Miss Laura”, her girls and their gentlemen callers as well as the details of the house and how it became the Visitor Center. Last on our list of places to visit was the home and museum of General William O. Darby who formed the special WWII unit eventually called the Army Rangers. This is privately run and hours very. When we were there the docent was one of the founders. Sensing an interested audience talked for almost two hours and displayed items in their collection not normally on display. We had to graciously depart or we would have been there a lot longer. We can’t find our pictures so these are from the internet. The second trip took us to the north central part of the state near Harrison and the Buffalo River National Scenic Riverway. We rented a dog friendly cabin through VRBO (Vacation Rental By Owner) at the same price as a motel room. We visited the Buffalo River National River, a NPS site although it was too chilly for on the water activities. We did a few short hikes and enjoyed the area. We are saying “when we come back” as it would be a fabulous place to paddle. Yes there are shuttles available if you like us have only one car. We also drove to the Mountain Home area to visit one of Steve’s uncles. Trip number three was at the end of our stay and we headed to Petit Jean SP. This was Arkansas’ first state park. Stephen Mather, first director of the National Park Service was consulted and you can see his influence in the lodge. It looks like a smaller version of the great park lodges of the west. The CCC did a lot of work here in the 1930s from building cabins (like the one we used), to a stone water tower, to furniture still in use at the lodge today. For those who can do a strenuous hike there is a beautiful waterfall. We plan to return some day and use the excellent campground. The story of Petit Jean, a young woman who stole aboard ship to be near her beloved but pretended to be the cabin boy. A favorite of the crew “he” was nicknamed Petit John. Not until “he” became ill was it discover she was a female. She died and is buried at the park overlooking the Arkansas River. Some day trips took us to Mt. Magazine SP, the highest point in Arkansas. This park also has a beautiful lodge and some of the cabins come with hot tubs! We are very impressed by the state parks we have seen in Arkansas. On our way there we stopped at Hickory Nut Overlook for a great view of Lake Ouachita and Ouachita National Forest. Another trip took us to the Lum & Abner Museum. I don’t remember this radio program but a friend of mine does who was raised in Arkansas. They were local “class clowns” who entered a local station’s talent contest making up the characters of Lum and Abner from Pine Ridge on their way there. Like Andy Griffith they used their home town area and people they knew in the routine. They became regulars and later went on to be syndicated. The store they featured in the program is now the museum. It is full of L&A artifacts and implements from early years in the Ozarks. Heading south we visited Hope, AR, and the NPS site, boyhood home of President Bill Clinton. Arkansas loves Bill Clinton. Hot Springs is where he graduated from High School. There is a big sign letting you know it. Apparently, another claim to fame for this small town was the world’s largest watermelon. Now although surpassed several times, the sign still brags about the event. I had to stop and take a photo of a bit of roadside humor photography at a local grocery. The name of the town is Hope for a reason as it has seen better days and is hoping for a recovery. We made several day trips to Little Rock to visit Heifer International Headquarters, The McArthur Museum, eat at Cotham’s Mercantile, tour the Arkansas Capitol and return to Central High NHS since we’d missed the ranger led tour when we were there in 2014. Steve’s Mom has been donating to Heifer International in lieu of giving Christmas gifts for the past several years. We were very impressed with both the philosophy of the organization and its totally green headquarters. 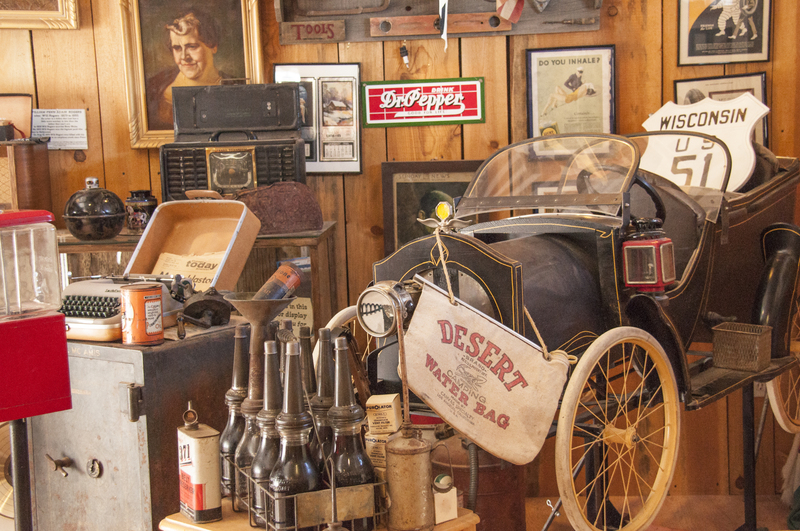 For history buffs the Mc Arthur Museum is a treasure. This is where General Douglas McArthur was born. Right next door is the Arkansas Art Museum where we viewed early works by Ansel Adams. If you are going for lunch at the original Cotham’s Mercantile (there is a new one in town), do get there early. It gets busy by noon. They’re famous for the Hubcap Hamburger. Free tours of the Capitol give you an overview of state history and government. It is the only state that let’s you enter the vault and hold on to a big pile of cash. They do insist you give it back though! For anyone wanting to have an “in the moment” experience of what Civil Rights in the 1960s was all about should take the ranger led tour at Central High NHS. Since Central High is still used as a high school the tours inside are available only when school is in session and very restricted hours. You need to call ahead and claim a spot but the tour is free. What’ s So Hot About Hot Springs? Before we wind up falling further behind in posting than we already are, here’s a post on our time in Hot Springs. Arkansas from January-March 2017. Our first visit to this area was in 2010 before we were full time RVers. Still dazzled by the splendor of the western parks we were very unimpressed with Hot Springs and left wondering why this was a National Park. A National Historic Site or even a Monument but a National Park? We are so glad that we had the opportunity to return, spend time and learn about both the national park and the city. We really had missed the boat the first time around! So if you come here be sure and take the time to do tours and come prepared to learn. Both the park and the city have lots to offer but you can’t do it by whizzing through in a day or less. It is like an iceberg. There’s what you see above the water but when you start looking deeper there’s more and more. We were working at the Fordyce Bathhouse Visitor Center, the museum and information center for Hot Springs National Park on Central Avenue in the historic district. There are 8 remaining bathhouses along what is known as Bathhouse Row in the national park and 6 of them are open to the public: the Fordyce visitor center, the Lamar gift shop and the Ozark art museum for the park, 2 operating bathhouses (the Buckstaff and the Quapaw) and the Superior microbrewery. So here’s some of what we learned and shared during our tours. Hot Springs National Park is the smallest of the 59 National Parks and the only one with a city completely within its borders. The geology of the hot springs is special because it is one of only 2 in North America not heated by volcanic activity. The rainwater takes 4,400 yrs. to travel over a mile and a half into the earth reaching 150 degrees but returns to the surface in about a year thus retaining its heat (139-143 degrees). So when you drink from the springs you are drinking water that fell as rain at the time the Egyptians were building the pyramids! That’s another big difference. Most national parks warn you to not take anything while Hot Springs NP encourages you to drink the water and take some with you by having drinking and jug fountains all around. In fact the original legislation protecting the hot springs states that the water will forever be free to the people. The springs yield, on average, 700,000 gallons per day. Of that the park collects and distributes about 250,000 gallons. People come from hours away to fill pickup trucks full of bottles with the mineral rich water. Don’t want to drink hot water? There are two cold springs from another source as well. However, don’t expect to dip in the springs outside. They’ve been covered up for over a century to protect them from man-made and natural contamination. We occasionally had the opportunity to assist the water technicians as they tested the springs each week. The park contains the oldest land in the world ever set aside by a government to protect a natural resource. That was in 1832. If they had named it a national park back then, Hot Springs rather than Yellowstone would have been our first national park. Instead it was called Hot Springs Reservation and did not come under the NPS until 1921 as the 18th national park. So what is a bathhouse? In the days before modern medicine (post WWII) as we know it, people had few medications and surgery was very risky. So they depended upon the curative properties of heat, light, water, exercise and later electricity. The bathhouses were the rehabilitation facilities of the day. We told visitors that coming to Hot Springs was coming to the Mayo Clinic on one side of the street (Bathhouse Row) and Las Vegas before Las Vegas existed in the city. Hot Springs was also the primary spring training area for major league baseball before it relocated to Florida. Other sports stars like Jack Dempsey trained here. Babe Ruth hit his longest home run here (over 500′). Follow the signs on the Baseball trail to learn more.The museum is filled with interesting old equipment.The Fordyce featured the best appointed gym in Arkansas when it opened in 1915. A few items like the Hubbard tank from the 30s and the Hoyer lift from the 50s I used during my career as a physical therapist. Well, not those models but a generation later. Once again I’m seeing my life in a museum! Make sure to take the guided tour and hear some stories. When that’s done, take a hike or drive and check out the view from the observation tower. Steve was reading in preparation for our next volunteer job about some of the ways Lewis and Clark handled medical issues using Indian sweat lodges and alternate heat and cold. Equipment may change but principles stay the same. The city is just as interesting. Gambling, bootlegging and other carnal activities were the main business. While never legal it flourished d/t payoffs to police and government official until the mid 1960s. When Winthrop Rockefeller was elected he vowed to clean up corruption and gambling. He did. Learn more at the Ganster Museum. We enjoyed the tour there and as you can see hammed it up a bit with some pics. At the same time the golden age of the bathhouse was declining. Hot Springs fell on hard times. In the late 1980s the NPS remodeled the Fordyce Bathhouse into the Visitor Center and repurposed others. This was no small task. Today you can visit the Fordyce and see the most opulent of bathhouses restored to its former beauty. Don’t miss the beautiful stained glass on three of the four floors or ride the original elevator car. Only the Buckstaff never closed its doors. Today you can experience treatment as if it were one hundred years ago at the Buckstaff or enjoy the mineral rich spring water at the Quapaw Baths spa pools. We did both and came out feeling like a piece of cooked spaghetti each time! I (Steve) had a bad cold and went to the Quapaw. Almost immediately I could feel the congestion in my chest lessening. I do believe soaking in the water cut the length of my cold in half. The architecture of the town from the 1890s-1940s is terrific and makes for some great photos. Like to shop? Only your credit card limit will dictate where and how much. Hungry? We enjoyed numerous good restaurants in Hot Springs. A few of our favorites were McClard’s for BBQ (also Bill Clinton’s), Colorado Grill for Mexican, Rolando’s for Ecuadorian, buffets at the Arlington Hotel, a Southern Living best breakfast winner Colonial Cafe and the Ohio Club where you can rub elbows with Al Capone (or at least his statue). For fun in the evening catch the monthly free performances of the Jazz Society, attend a show at the Five Star Dinner Theatre or feel like a kid at the Maxwell Blade Magic Show. Garvin Gardens was just as magical in the Spring as it had been at Christmas with a sea of tulips at peak bloom. We didn’t go to the horserace at Oaklawn but it is a big attraction from late winter through April. In summer there is the Magic Springs amusement park and all the water sports of lakes Hamilton, Catherine and Ouachita plus the Belle of Hot Springs riverboat. When all is said and done it is the people from Hot Springs National Park we will remember. We made new friends with several volunteers. The Rangers were fantastic. They coached us and taught us so that we could hone our interpretive skills. They made it possible for us to visit places not open to the public such as the water distribution system, the Hale and Maurice Bathhouses and the museum archives. They thanked us for our time volunteering at least once a day. While we enjoy new experiences by volunteering at different parks or for different agencies, if we ever do repeat a job this will rank high on the list. Thank You Hot Springs National Park for a fabulous three months! Talk with any full time RVer and they will soon tell you of some mishap or breakdown. It happens to all of us. We’d been going along just fine. However since we had done a lot of mountain driving Steve thought it would be a good idea if we had our trailer brakes checked and wheel bearings packed. So we pulled into an RV dealer in Redding, CA for what we thought would be a quick top. Not so. When the tech pulled the wheel off and did an inspection he found we’d been driving around with a broken leaf spring. we could have had a collapse of our suspension. 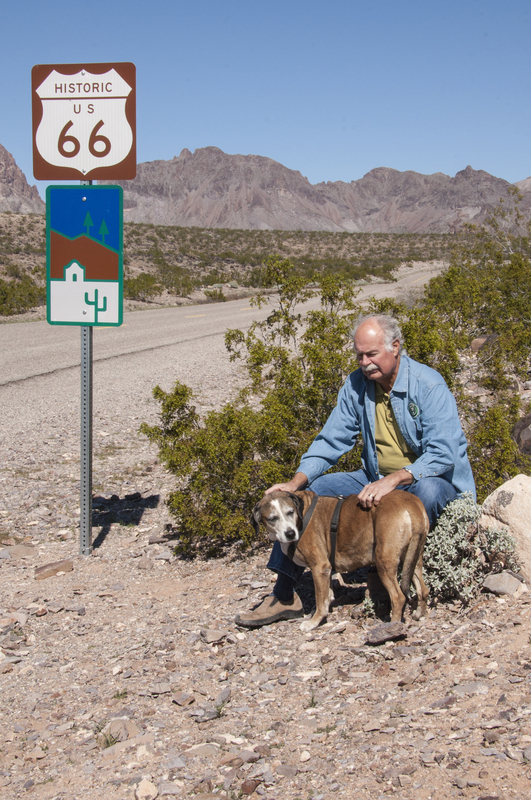 Thinking about the steep descent into Death Valley made us thankful for our Guardian Angel. He (She) certainly works overtime on our behalf! The RV was already up on jacks. We were allowed in one at a time to retrieve belongings and head to a motel. Our quick stop turned into a five day stay thus canceling plans to head for the redwoods. All of this happened only one month before our extended warranty plan expired. I bet they were really glad to get rid of us! After eating out for almost a week we were glad to stay home and cook. Redding, CA is in the heart of wine country east of San Francisco. We spent time just driving the area in between frequent checks on repair progress. One side trip was to drive to the outskirts of SF to visit the Rosie the Riveter NHS. Both Steve and I grew up in families where our parents had been in WWII. We remember sitting around the dinner table listening to their stories. the Rosie the Riveter site is located in an industrial area where the Kaiser shipyards were located during WWII. Unlike most WWII museums it focuses on life on the homefront during this time. With able bodied men overseas women and those who couldn’t serve came into the workforce as never before. Race relations also came to the forefront. This would set up events for the 60s and 70s as Civil rights and Women’s Rights took center stage. We were treated to a talk by the oldest working NPS Ranger (88) who had worked in clerical duties during WWII later becoming an activist in Civil Rights. As one of the newer NPS sites it is still developing but offered us insights and information we did not know before even though we thought we knew quite a bit. If you are in the SF area, do make a visit. The most famous of all WWII posters is the namesake Rosie The Riveter poster by Norman Rockwell for the May 1943 Saturday Evening Post. The name came from a pop song of the day. Rockwell used the image of Michelangelo’s Isaiah in the Sistine Chapel to depict a strong, capable woman. So far our Spring travels through Arizona had been full of mishaps. So as we headed to Lake Havasu City on the AZ/CA border would it be third time is the charm or three strikes and you’re out? We are glad to report that all was well and we had a fabulous week. Our campsite at Lake Havasu State Park was one of the best we’ve ever had. The weather was glorious and you can see why this is another snowbird Mecca. 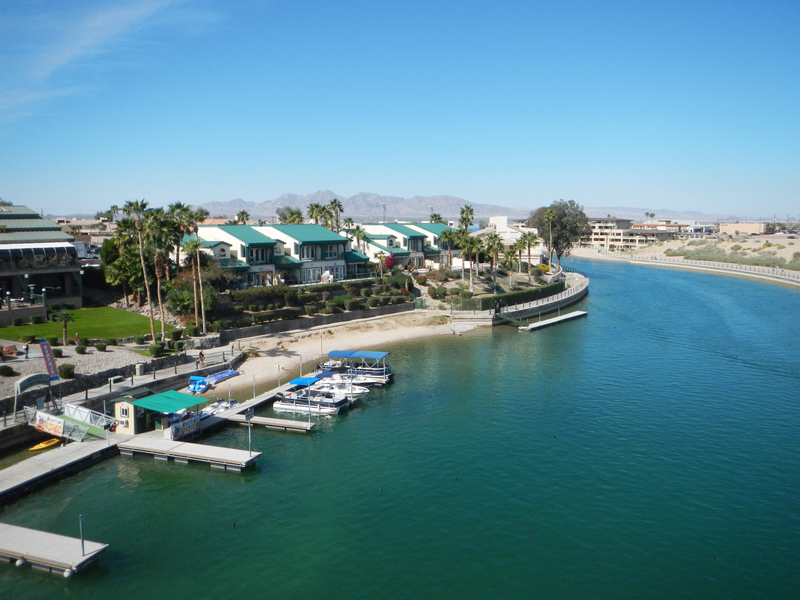 You are immediately identified as a visitor if you say Lake Havasu as the residents simply slip over the the second A and say Hav-su. 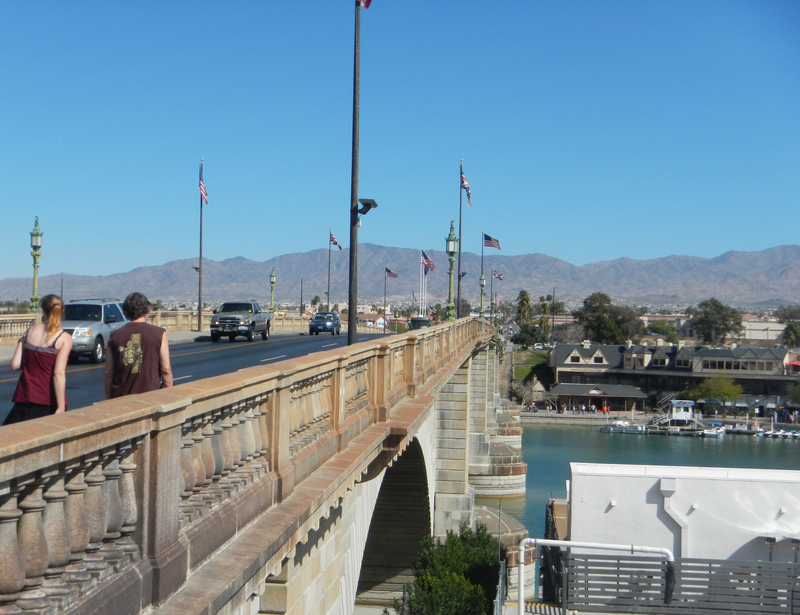 The icon of the area is the London Bridge which was moved here from London during the early days of development at Lake Havasu and opened in 1971. The developer needed a bridge from shore to an island resort. Hearing the London Bridge was for sale he purchased it, built an inner structure of steel then moved the exterior blocks to Arizona and rebuilt it. Each solid granite stone was numbered, transported and reinstalled. Some numbers are still visible. I had the bridge tour on my list of things to do. I thought it would be very touristy and trivial but being a “good hubby” I agreed to go. The tours are given only a few times each week and last about 90 minutes. It starts with a bit of history. 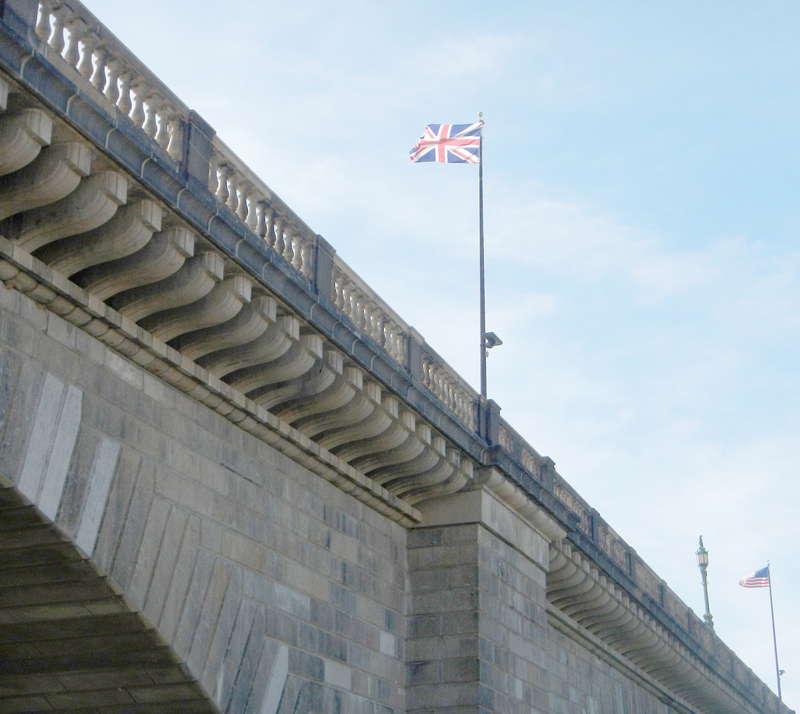 Here we learned that there have been several London Bridges over the centuries. The children’s song “London Bridge Is Falling Down” refers to when the Vikings came up the Thames and rammed the bridge causing it to fall into the river. Then we walked around and over the bridge while our British tour guide gave a very good talk. 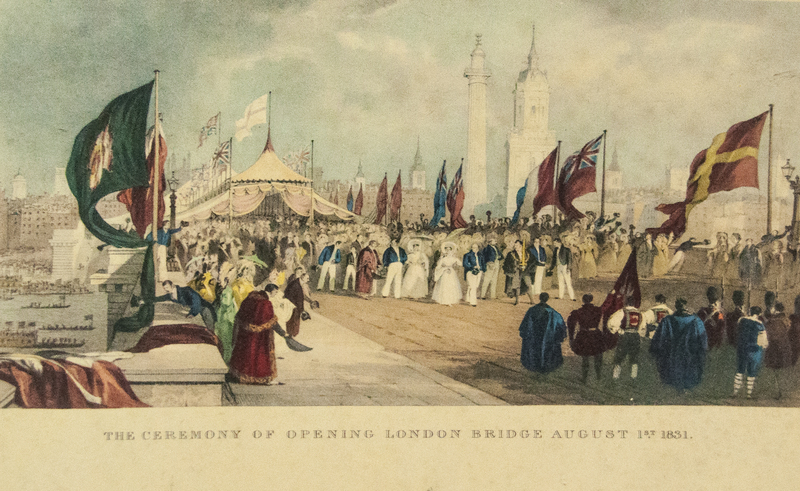 We learned that the lamps on the bridge were fabricated from Napoleon’s cannon after his defeat by the British. There is even a spot where two American G. I.’s carved their initials during WWII. Much to my surprise the tour was excellent and well worth taking. Told you so! 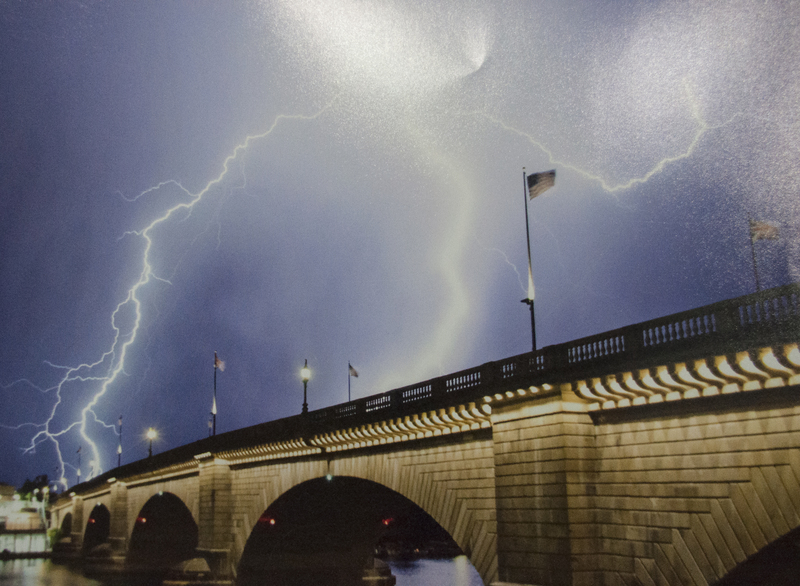 Picture From The London Bridge Visitor Center…What Fool Would Be Out Here? We did also enjoyed the local community theatre production of Sweeney Todd, local ice cream and did some shopping as we’d be heading into sparsely populated areas in the near future. We visited the Bill Williams NWR and planned to return for a kayak trip but then got busy with other things and never returned. A good reason to return if we need to have an excuse. 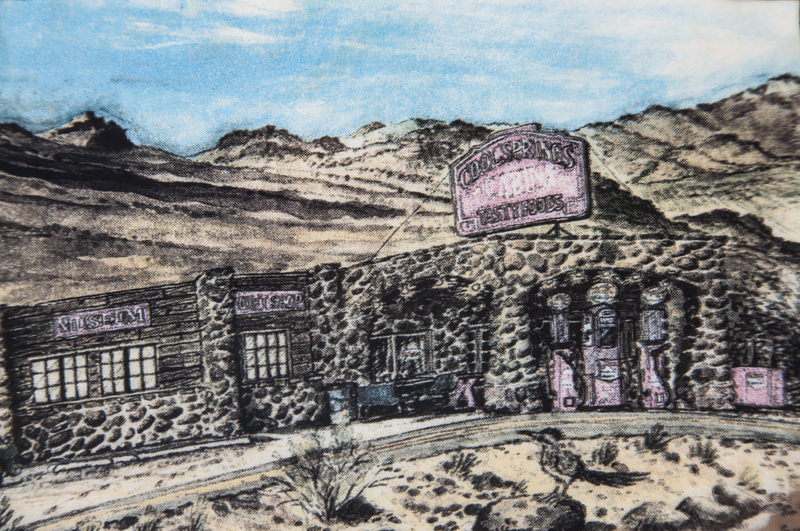 The refuge is located with the Visitor Center on the lake side and wonderful wilderness trails across the road in a desert area. What a contrast! Six months ago Chari had reconnected with her second cousin, Kathy, who lives near Milwaukee, Wisconsin. Although they have been e-mailing they have not seen each other in forty years. Kathy and her daughter, Emily, were spending a long weekend in Las Vegas which was about three hours away. We decided to meet halfway in Laughlin, NV. 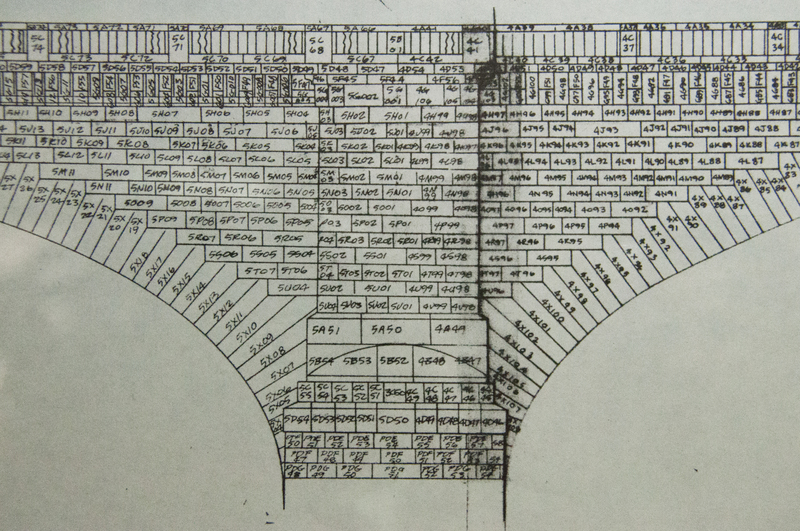 Kathy has become the Manchester family genealogist and has discovered lots of interesting history. I never knew I had an ancestor from Switzerland or that there was a family farm in New York only 100 miles from where I grew up! We met for brunch and had a great time. Another day Steve and I went for one of our “day trips” of 150 miles or so to visit the Mohave Desert Preserve NPS site. We were enchanted by the desert landscape and spoke with the ranger in charge of volunteers about the possibility of working here during the winter of 2017. We’ll stay in touch. We only had time for a quick visit but did watch the park movie which shows the varied areas of the park. 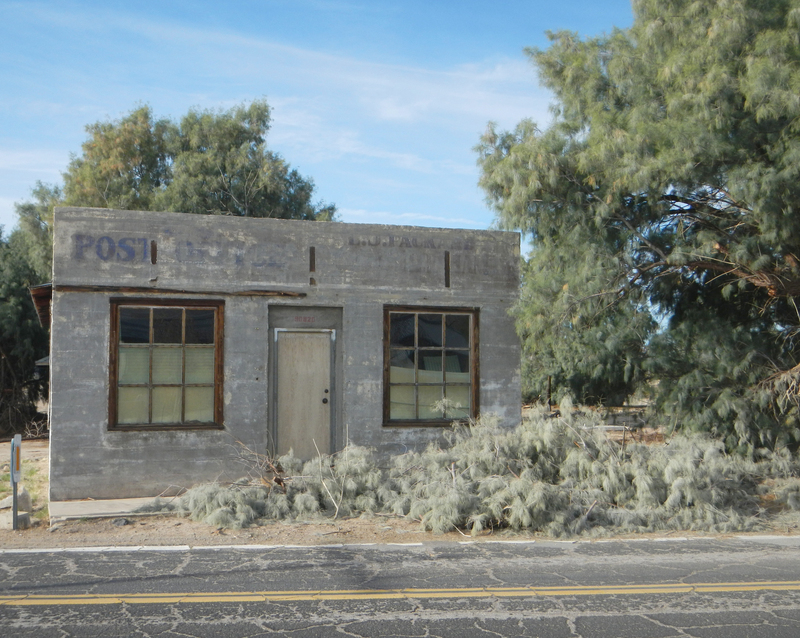 Kelso Depot is an old train station (1924) from the days when the town of Kelso was a thriving community. Kelso was where trains headed west stopped to pick up their “helper” engines to climb the steep terrain of the Providence Mountains and reload with water for the steam engines. 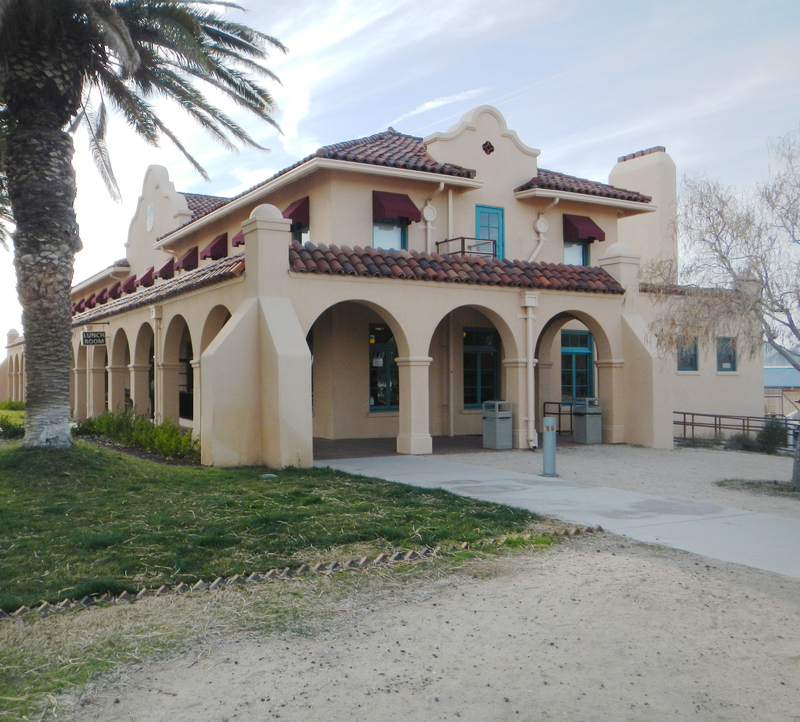 The depot was also used by Union Pacific RR workers as a dormitory and recreation facility. Kelso faded away after WWII when the more powerful diesel engines became commonplace and was closed in 1985. The depot was saved from demolition and became the NPS Visitor Center in 2005. During WWII Kelso was also the home of workers from the nearby Vulcan Mine (iron ore). Between the RR workers and the miners Kelso had many drunken residents who wound up spending a day or two in the town’s jail. 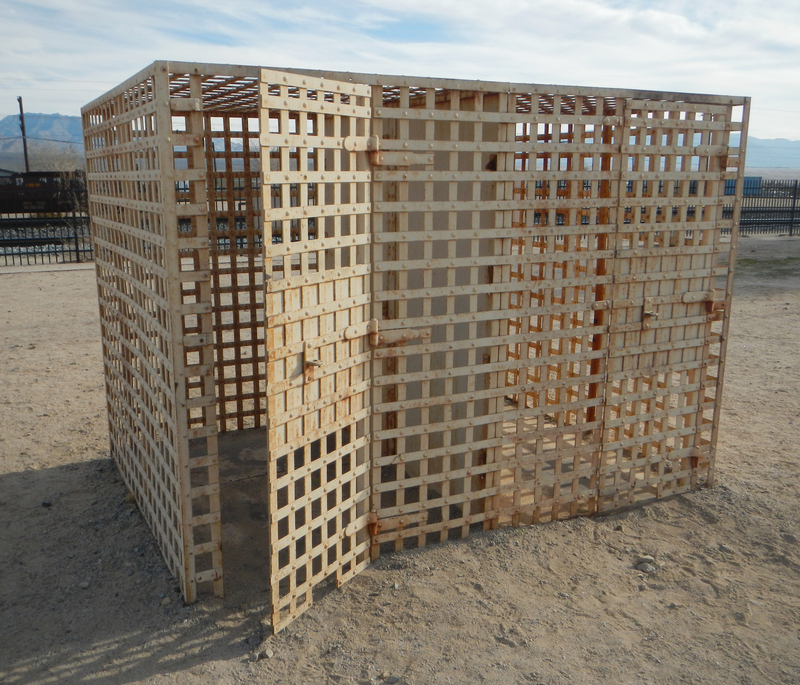 The jail had been moved to the backyard garden of some Barstow residents after the depot closed but was returned and donated when NPS took over. 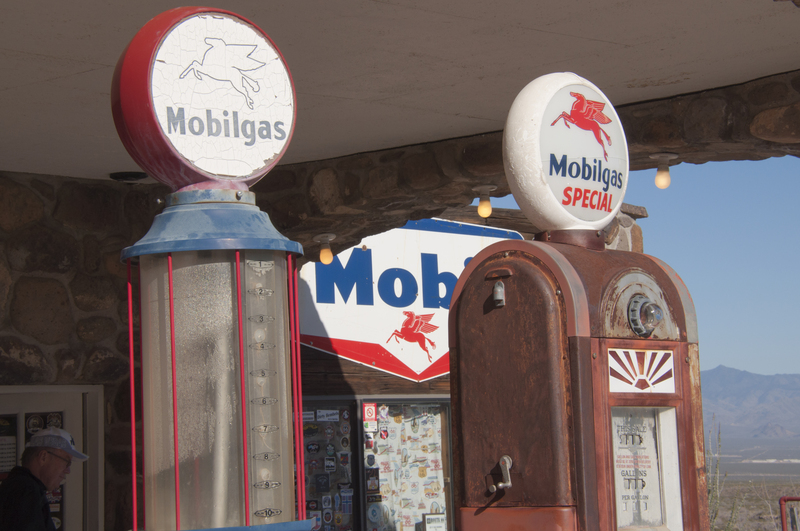 Another day of exploring took us to one of the best preserved sections along former Route 66 between Kingman and Seligman in Arizona. 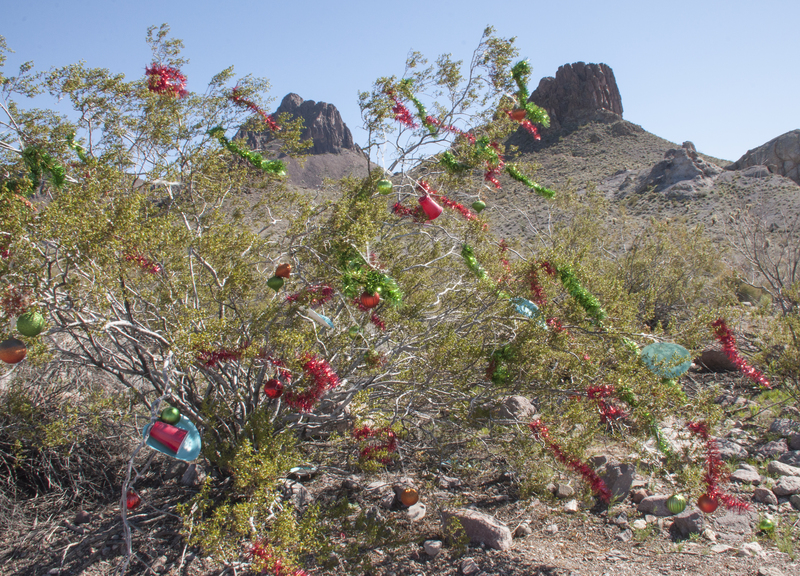 As we approached the town of Oatman, which had been touted as a picturesque town on 66, we found several creosote bushes with decorations left from Christmas. A local custom we presumed. 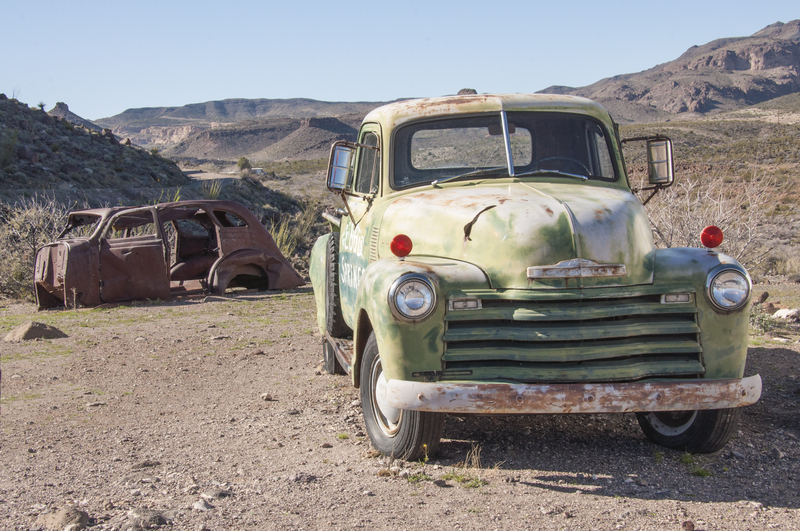 We arrived in Oatman and parked in the city lot. 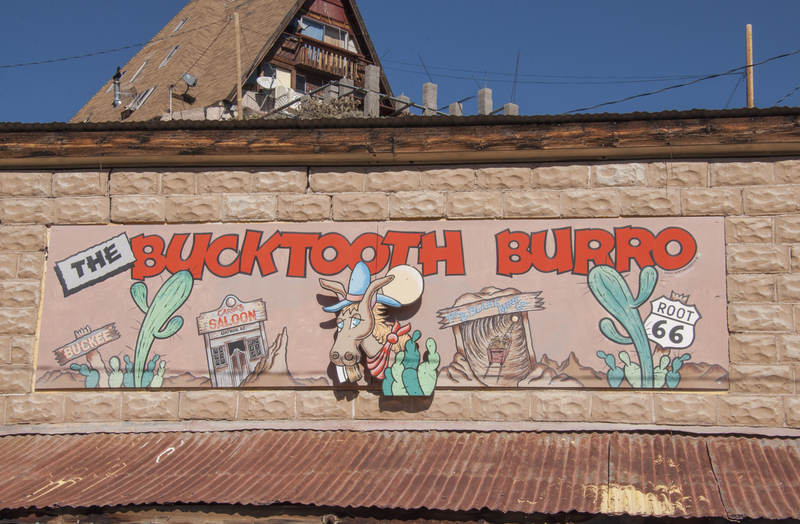 You need to pick your way carefully through town as one of the “attractions” are the “wild” burros. 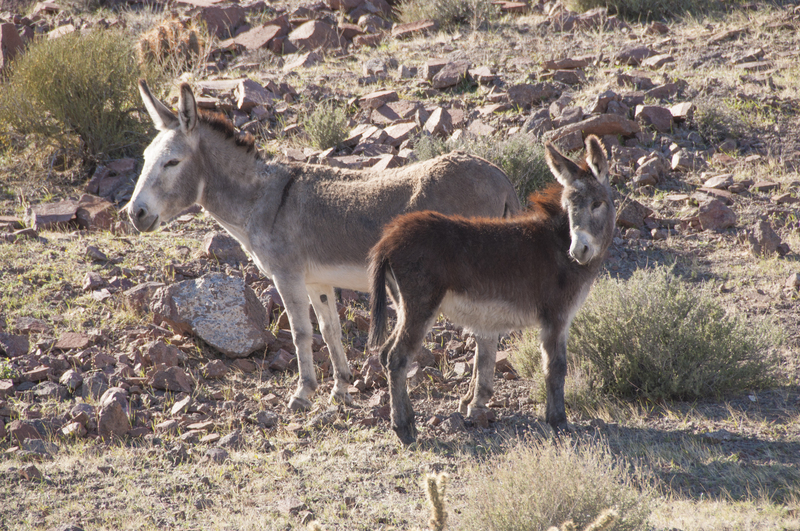 The burros are used to being fed hay cubes you can buy and are not shy nor are they reluctant to leave the remains. Step carefully! When we arrived a show for all the tourist buses had the one and only street blocked so we checked out some shops. Only one description is needed for this place: Tourist Trap!!! When the road finally opened we continued along Rt. 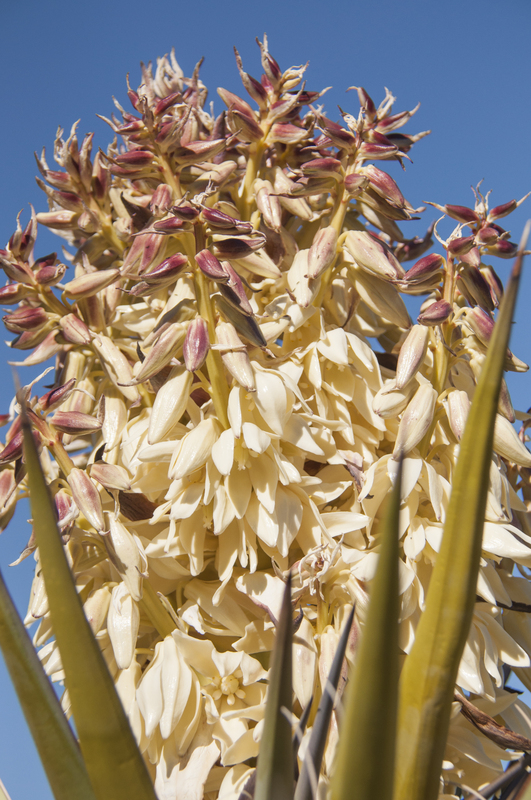 66 and did find some real wild burros, great scenery, Yucca plants in bloom and an interesting remnant of days past called Rock Spring. It was a former gas station along Rt. 66 now a convenience store and museum. There was a lot of interesting memorabilia here. 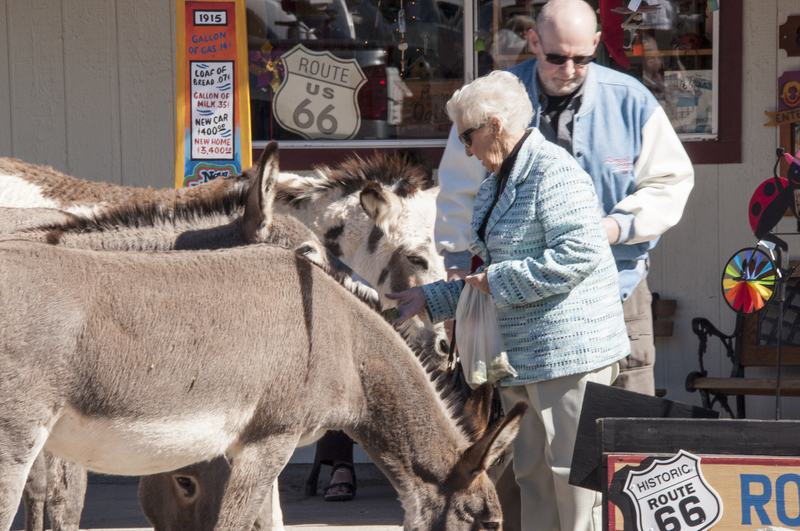 It has retained a lot of its character because, much to the owners dismay, the tour buses can’t negotiate the tight turns between Oatman and Rock Springs. Time to leave Arizona for this trip. 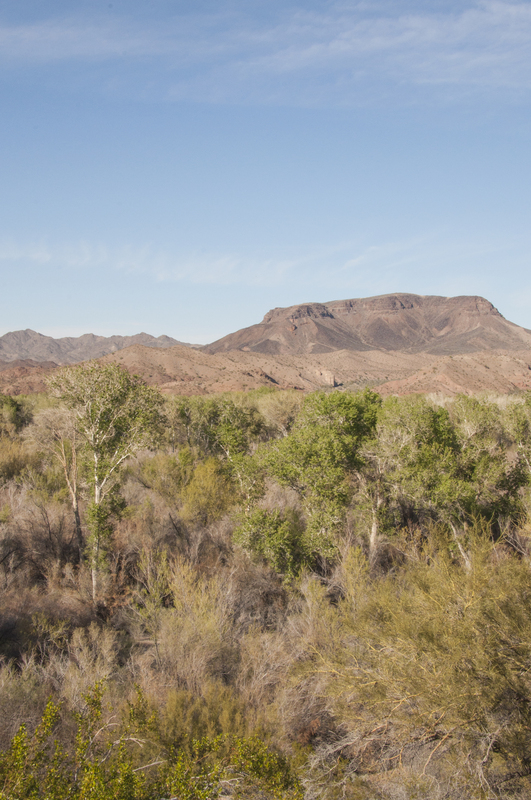 Next stop is Lake Mead National Recreation Area which is only three hours away. With less than two weeks left at Red Rock Lakes NWR we drew up a plan for our next two and a half months of travel en route to Petrified Forest National Park. We are continuing to make seeing more National Park sites a priority. Our route will take us to or near 12-15 more parks. We’re getting close to our goal of having visited 33% of the NPS sites by the end of 2014. Will we make it? You’ll just have to follow along and find out. 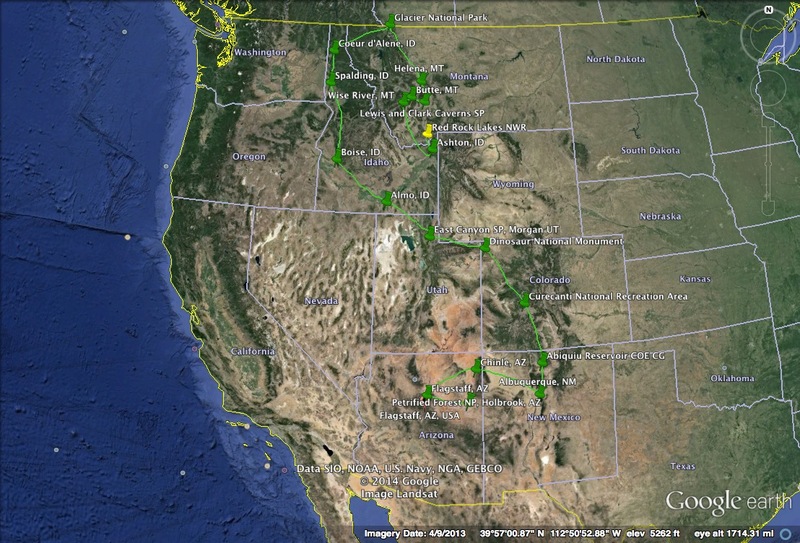 For easiest viewing, click on the picture of our route to enlarge.